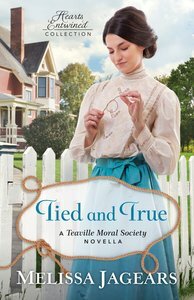 About "Tied and True (Hearts Entwined Collection Series)"
Melissa Jagears, an ESL teacher by trade, is a stay-at-home mother on a tiny Kansas farm with a fixer-upper house. She's a member of ACFW and CROWN fiction marketing, and her passion is to help Christian believers mature in their faith and judge rightly. Find her online at www.melissajagears.com. Customer Reviews For "Tied and True (Hearts Entwined Collection Series)"
Such a lovely story about the meaning of true love. Not just a flighty little attraction, but a love that withstands time and hardships and rejection. Marianne is in love with Calvin and she just KNOWS that he's in love with her. The problem is, he's been hurt in the past and is afraid that her love will be unable to withstand the hard times. Determined to prove him wrong, Marianne sets about to prove her faithfulness. Author Melissa Jagears has created a beautiful story that is filled with a sweet love that flows warmly through you and reminds you that love isn't always two-sided and sometimes you have to work hard with nothing but the HOPE of a return on it. Bravo, Ms. Jagears! I will be looking forward to getting my hands on the rest of this series!